The new RoboSHOOTplus has been released and is available now. This product update transforms the capabilities of RoboSHOOT to take advantage of the new Fujifilm X500 flash system and extends it even further. AutoFP/HSS – Auto High Speed Sync with both TTL and Manual** control. 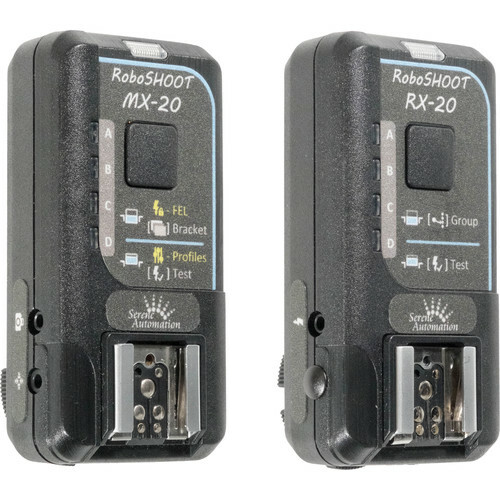 Multi-Angle** – With an MX-20 and App, your RX-20s can activate the shutter of additional cameras. See Full User Manual for details. Enhanced App** – improved group control, firmware updater, settings, and more. External Sensors** – Finally, full support of sensors! (soon to be available for pre-order). Items marked with ** are RoboSHOOTplus Exclusive and extends what is available via the X500 flash system from Fujifilm. For a complete list of features please see the Feature Comparison Chart. This upgrade is available at no cost to existing customers for self-installation or a nominal cost if you like to the Serene Automation upgrade service. For new product purchases, the price of the MX-20plus kit will not change, while the MX-15plus kits will incur a slight increase. Visit the company website or contact info@sereneautomation.com for further details. This entry was posted in Fuji flashes, Fuji X-Pro1, Fuji X-Pro2, Fuji X-T1, Fuji X-T2, Fujifilm GFX, Fujifilm GFX 50S and tagged Fuji GFX, Fuji GFX 50S, Fuji GFX50S, Fuji Rumors, Fuji XT1, Fuji XT2, Fujifilm, Fujifilm EF-X500, Fujifilm GFX50S, Fujifilm Rumors, Fujifilm X-Pro1, Fujifilm X-Pro2, Fujifilm X-T1, Fujifilm X-T2, Fujifilm XT1, Fujifilm XT2, FujifilmRumors, Fujirumors, GFX, GFX 50S, GFX50S, Medium Format, RoboSHOOT, RoboShoot MX-15, RoboShoot MX-15plus, RoboShoot MX-20, RoboShoot MX-20plus, RoboSHOOTplus, Super Full Frame. Bookmark the permalink. Trackbacks are closed, but you can post a comment.